Very good for a first car. Comfortable and affordable ride. I love that I am able to move my chair as high as I want. I love the features with the temperature, it is never too hot it too cold you can always make it perfect for you. Back seat has a spot for my little kids to sit their cups in or even put their heads on when they are sleepy. It has not failed me yet. Never had an issue with the car. The only issue I had at the beginning was my flex pipe had been broken and I had to get that fix, which made my oil leak and after that was fixed it has not been leaving at all. Cost me a round $120. Also it is very easy to tell when you something is not okay with the car. I recently started to hear something coming from my back tire and my mechanic stated it was my wheel bearing. Also this was my very first car and is still running like new. The only did I changed when I got it was the car stereo. Other than that, it is a perfect car first car. There is a locking feature for the trunk located in the glove compartment. 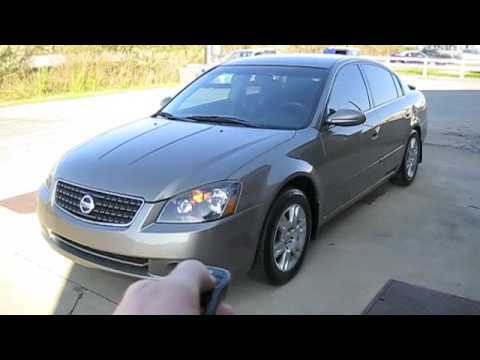 The 2005 Nissan Altima is an extremely reliable vehicle. Great for long trips or delivering pizzas; whatever your forte! It gets about 35 miles to the gallon and is easily repairable if any damage comes to it. It is a great starter car for teenagers and a comfortable car for when you get older and want something you can travel in. It handles well on ice or rain, high speeds are not an issue with it being as well balanced as it is, and cleaning it is a breeze. If you are a music lover, the sound system is great and acoustics are very good for such a small car. Seats up to five people comfortably and has an incredible amount of space in the trunk. All seat belts lock with any and every hard jolt the sensor picks up and the defog setting for the windshield has you ready to leave in a couple of short minutes on the iciest of days. 2005 Nissan Altima consumer happiness. My Nissan Altima has beige leather seats which have a built in heater for the cold winter days when you just get into your car and your heater is taking too long to heat up. It drives smooth and handles nicely on sharp turns as long as you take the correct angles and apply the correct amount of acceleration/deceleration. I enjoy the low cost of gas compared to other cars and that it takes about 40$ for me to fill it up in Austin Texas. My favorite part about this car is that the Nissan Altimas hold their value well over the years and can be easily resold once you are done driving it. The car itself is relatively easy to work on and you can do many of the minor repairs on your own. Overall this is a great car to get if you do not wish to take out a small loan to pay off a more expensive and slightly better car.